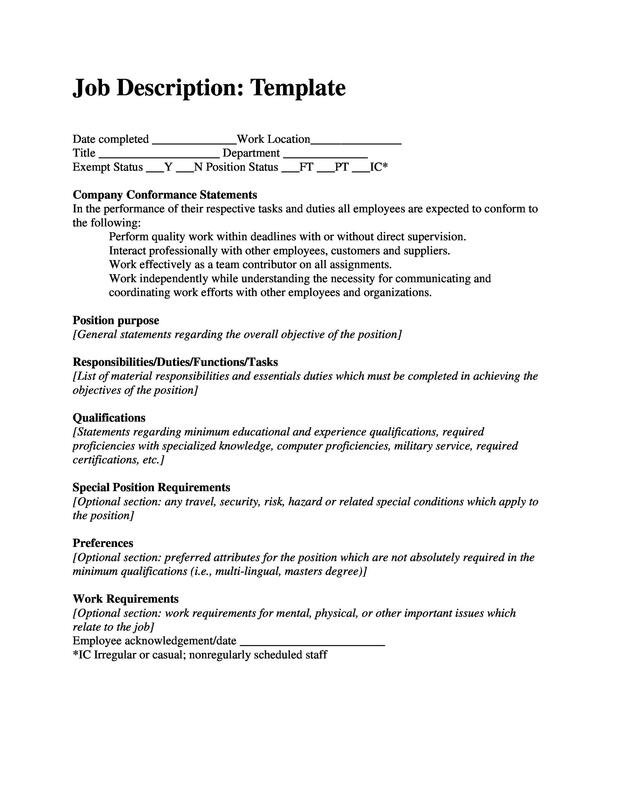 An essential part of hiring and managing employees, job descriptions are a broad written statement of a specific job. 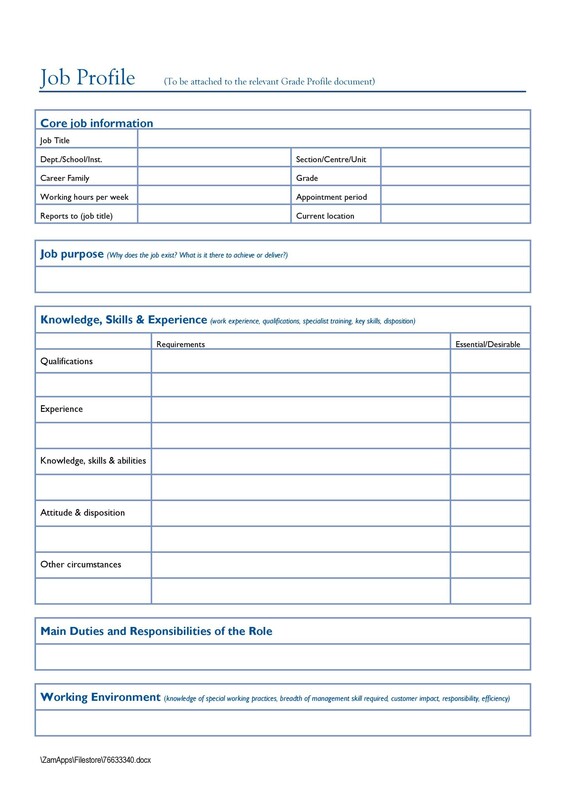 Generally, a job description includes the purpose, scope, duties, responsibilities, and working conditions of a job. 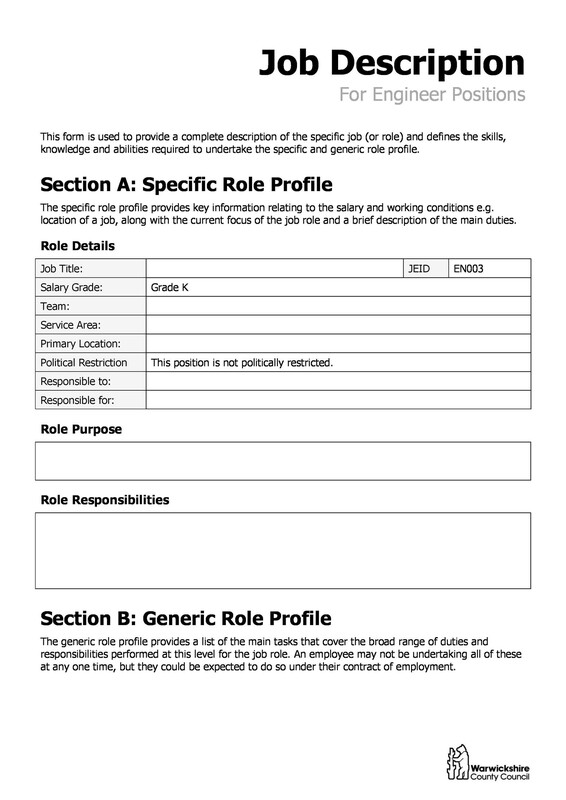 In order to provide employees with a reference point for their responsibilities and required level of performance, a job description looks to clearly define the role. 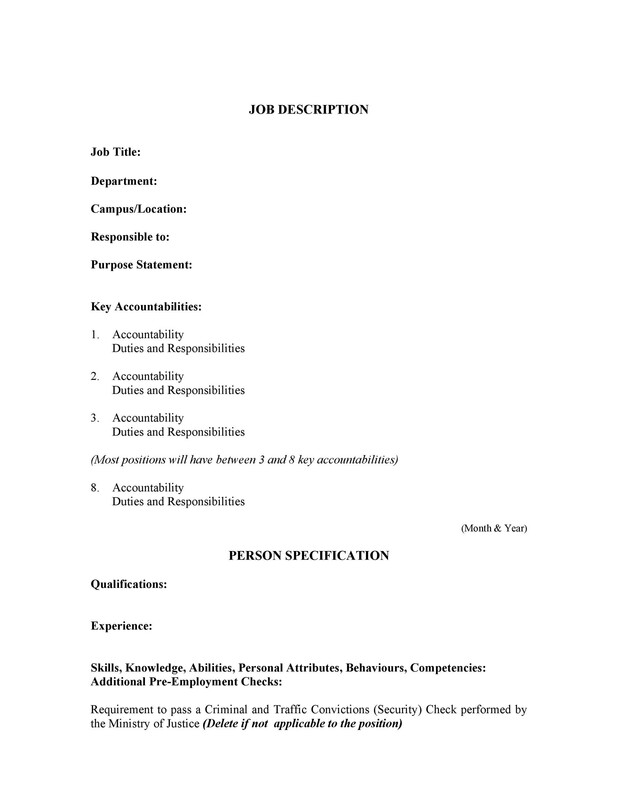 In order to attract a response from an internal or external job applicant, a job description describes the role and required credentials. 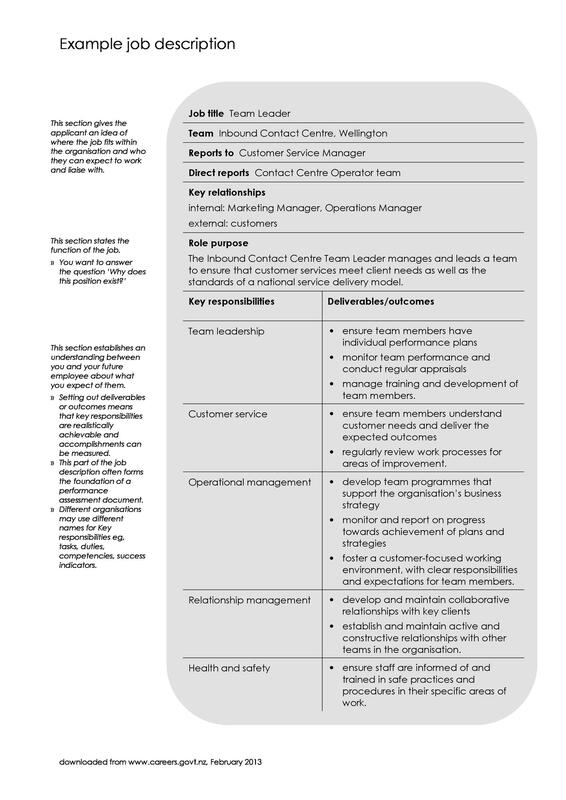 A job description provides management, in particular a new manager, with a reference point to understand the role’s scope and level of responsibility. 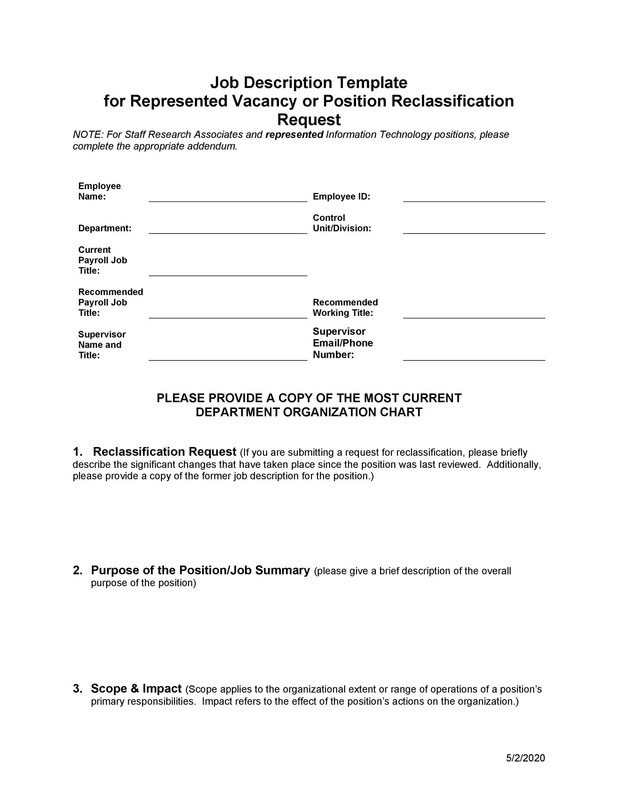 Do you or others in your organization update job descriptions regularly or when job criteria changes? Are employees involved in this process? Who uses or refers to job descriptions regularly? 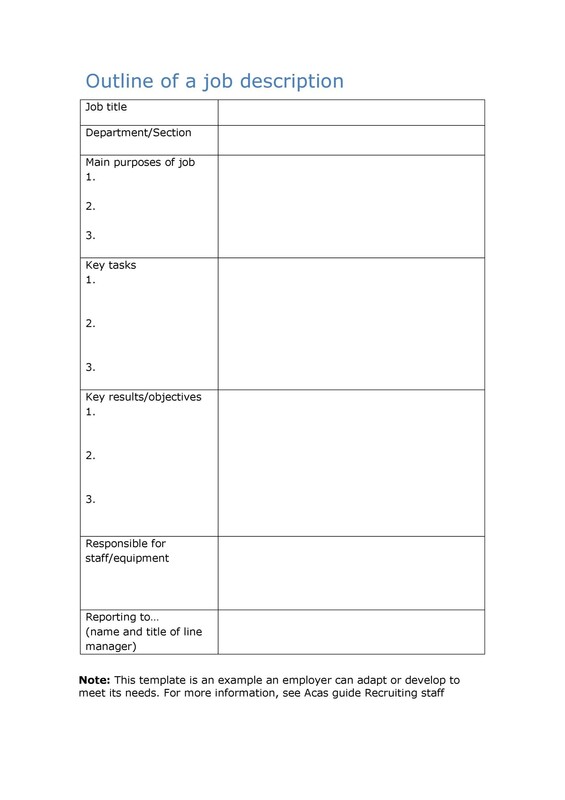 Do you use job descriptions to plan training activities? 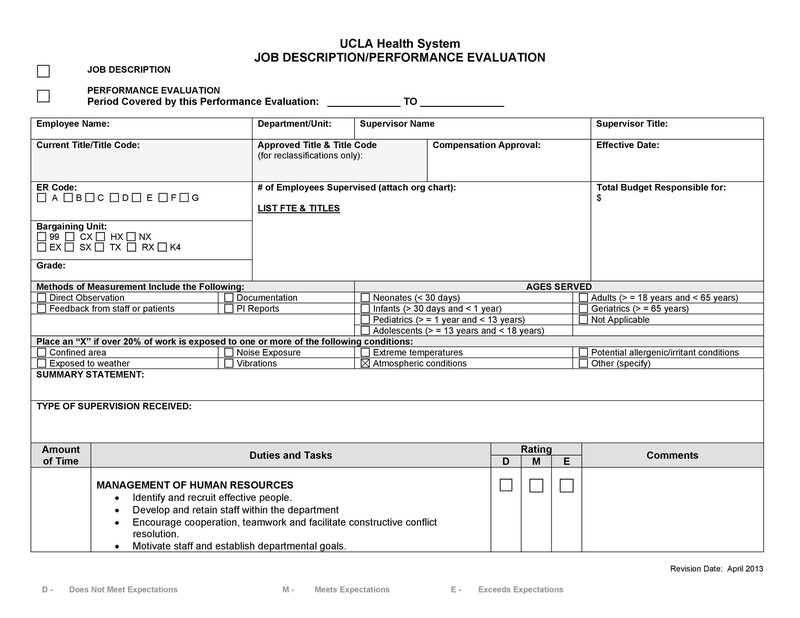 Do your job descriptions include performance criteria? 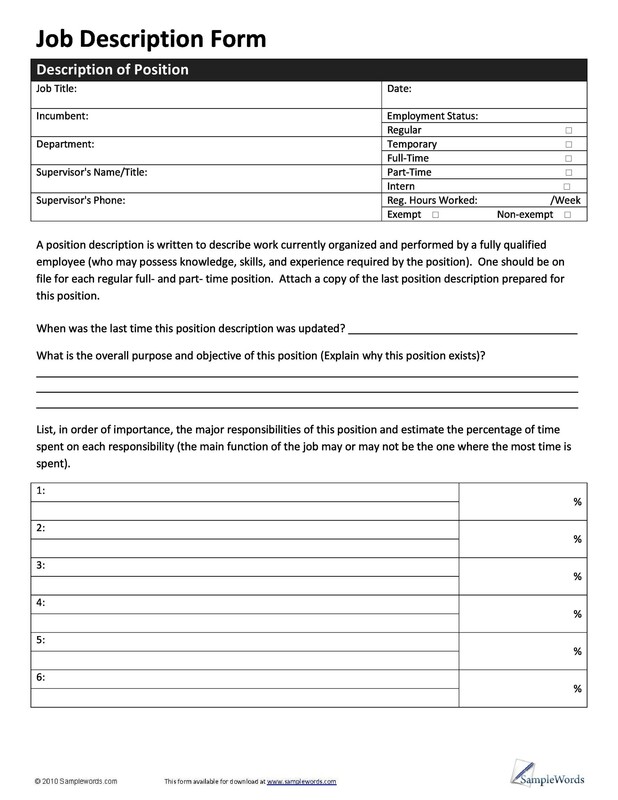 Can you observe or measure the criteria of your job descriptions? The first and foremost reason to use job descriptions is clearly and concisely communicating job requirements to applicants. It is important that applicants understand the core requirements of the position since you’re looking to attract and hire competent employees. A job description can help you to do that. Furthermore, a job description can exhibit your brand to prospective employees and give them a sense of the company culture. In short, a well-written job description is a communication tool that can help make the recruitment process easier and less costly for you. 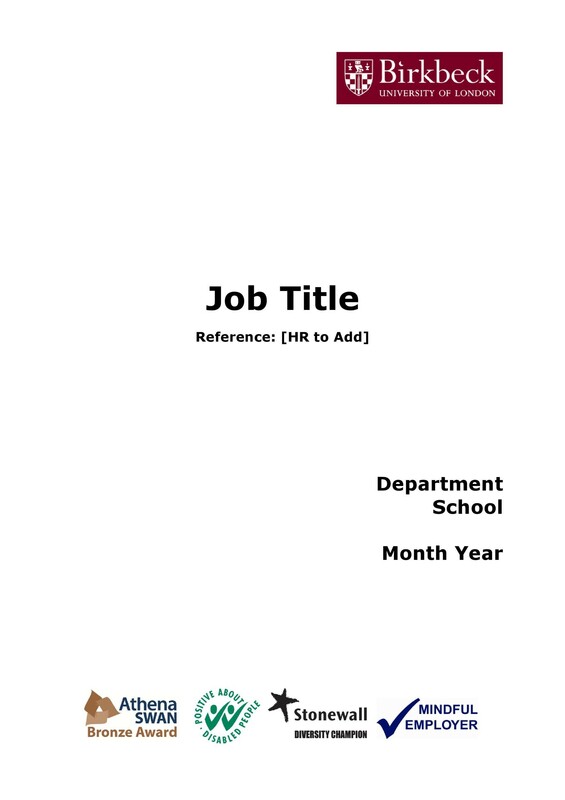 Job descriptions are a great tool for communicating organizational expectations to employees. Furthermore, it provides the employee the direction to achieve successful job performance. 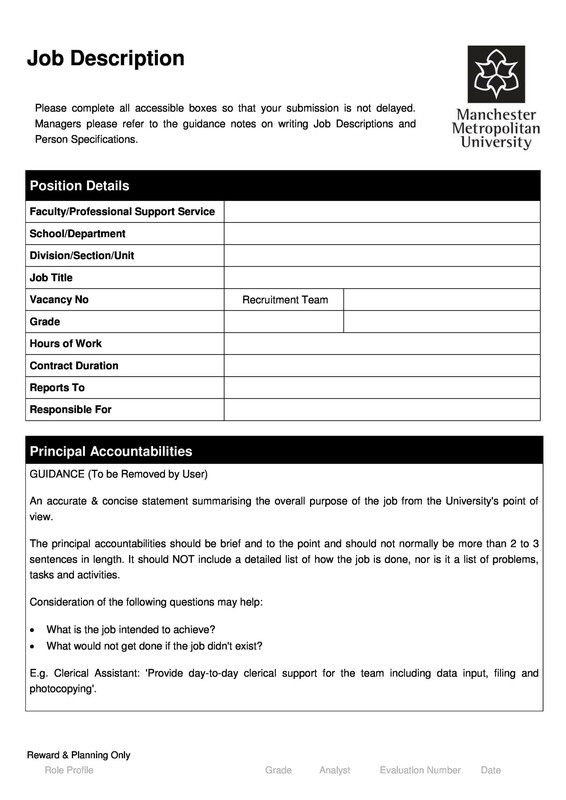 You can use the duties in the job description to set measurable performance goals. Once you’ve done that, you can train your employees to meet these goals as required. You can motivate your employees to pursue seminars, classes and other career development activities by using your job descriptions along with descriptions of realizable job promotions. 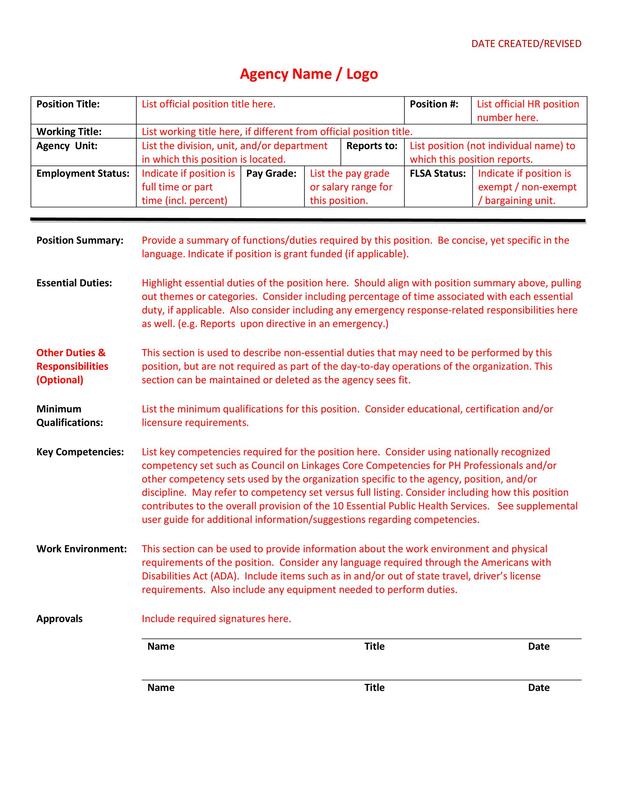 Using job descriptions, you can develop a standardized compensation program that includes the minimum and maximum for each position. 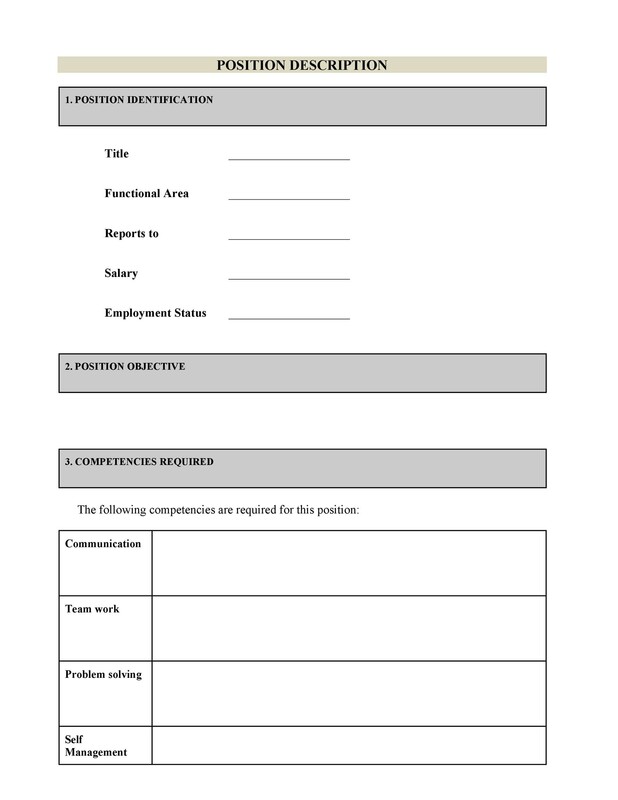 If required, you can use the job description to demonstrate that an employee isn’t performing job functions as required. In order to encourage employees to perform above and beyond the call of duty, you can use job descriptions as a baseline for performance. Any performance above and beyond should result in recognition and rewards. The Americans with Disabilities Act (ADA) and the Fair Labor Standards Act (FLSA) make written job descriptions increasingly important. 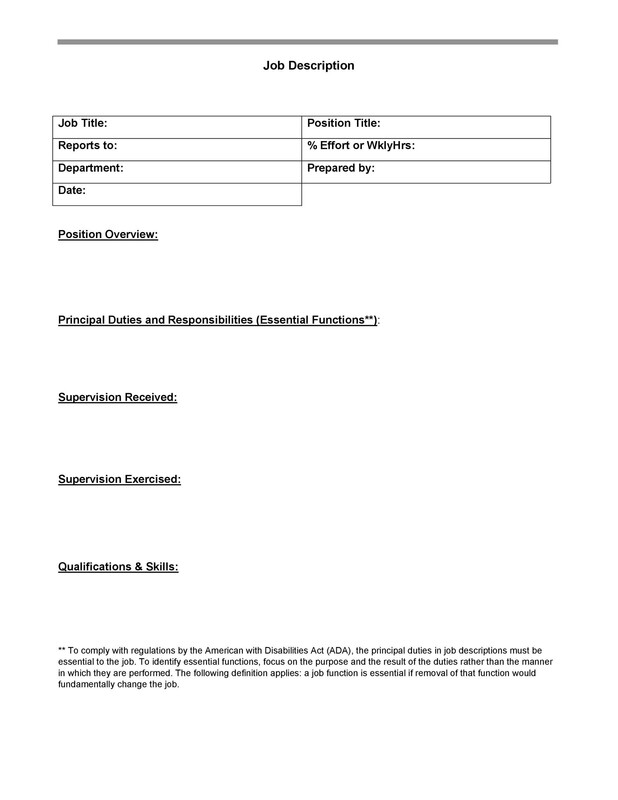 Job descriptions ensure your legal compliance with the aforementioned civil rights laws. 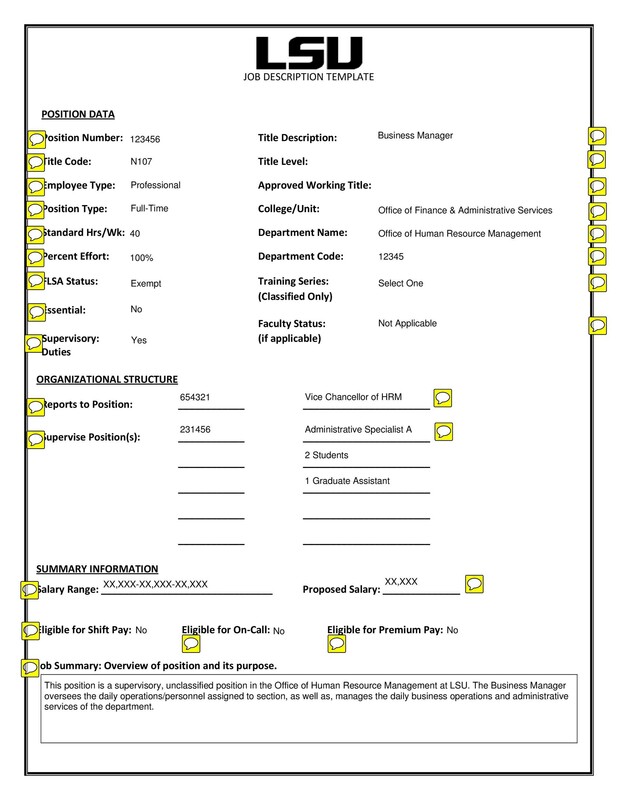 Details on the essential job functions are what a well-written job description can provide. 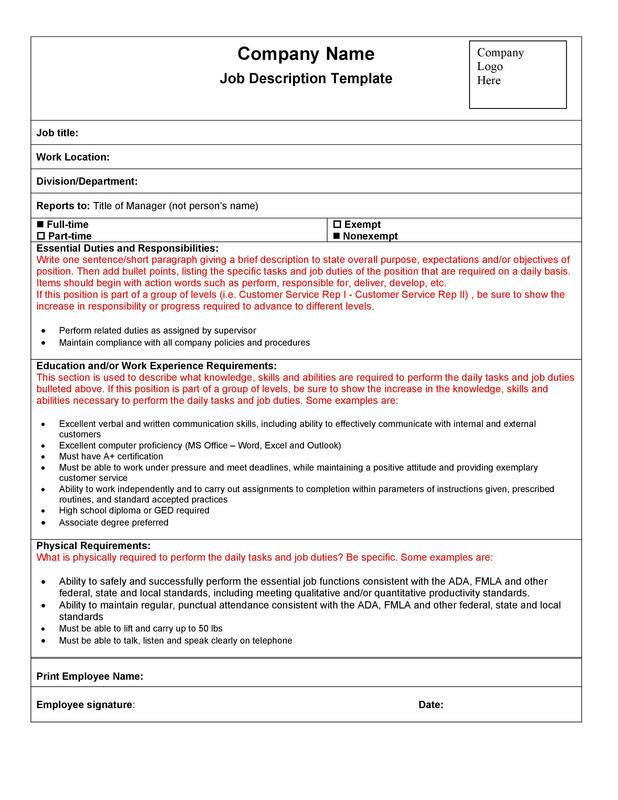 This is extremely helpful when an employee asks for a reasonable accommodation under the Americans with Disabilities Act (ADA). 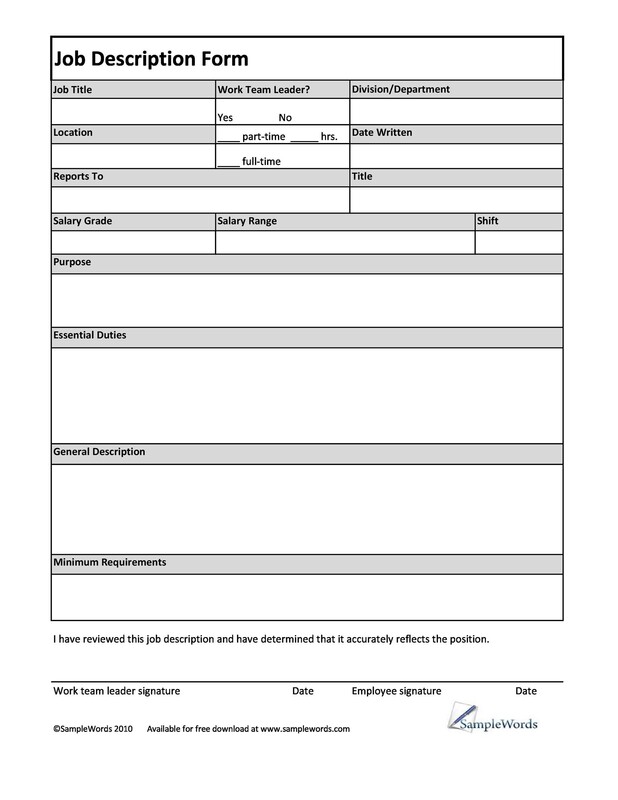 Your job description firmly documents the position’s educational requirements, physical requirements, employment experience, certificates or licenses required and supervisory responsibilities. 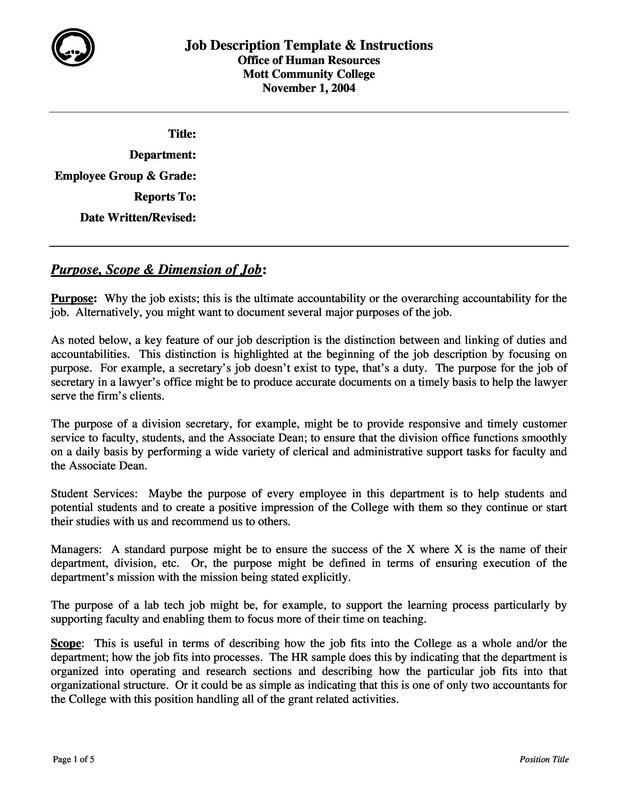 Therefore, accurate and well-developed job descriptions allow you to determine what constitutes a reasonable accommodation and establish controls for it. 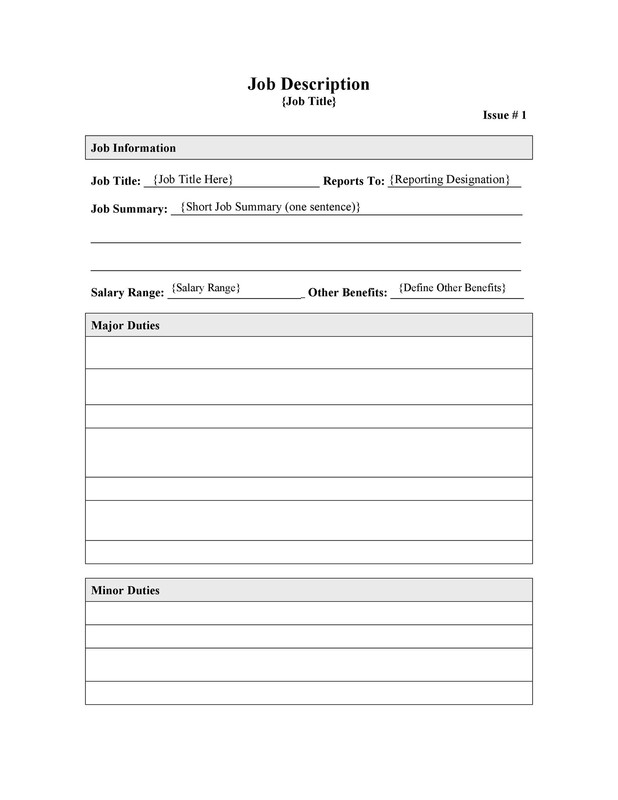 Additionally, job descriptions help you to comply with Fair Labor Standards Act (FLSA). You set the parameter for work hours, pay-type, and overtime by including a position’s FLSA status in the job description. 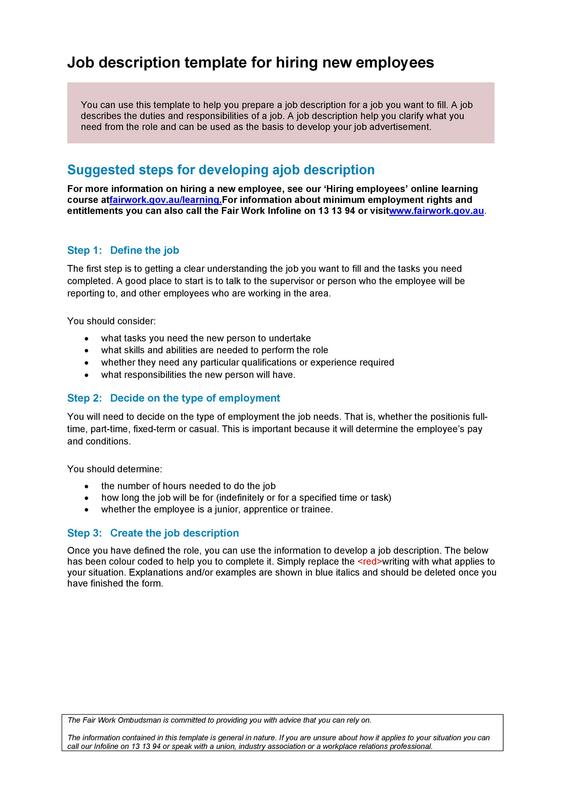 For employers, job descriptions are extremely beneficial and the process of developing them doesn’t have to be taxing. In fact, you should see the process of developing job descriptions as an opportunity to engage your employees and management. Flexibility is the key as far as job description is concerned. Creating job descriptions that focus more on expectations and accountabilities and less on specific tasks is a sensible thing to do. By doing this, you’ll encourage employees to focus more on results and less on job duties. 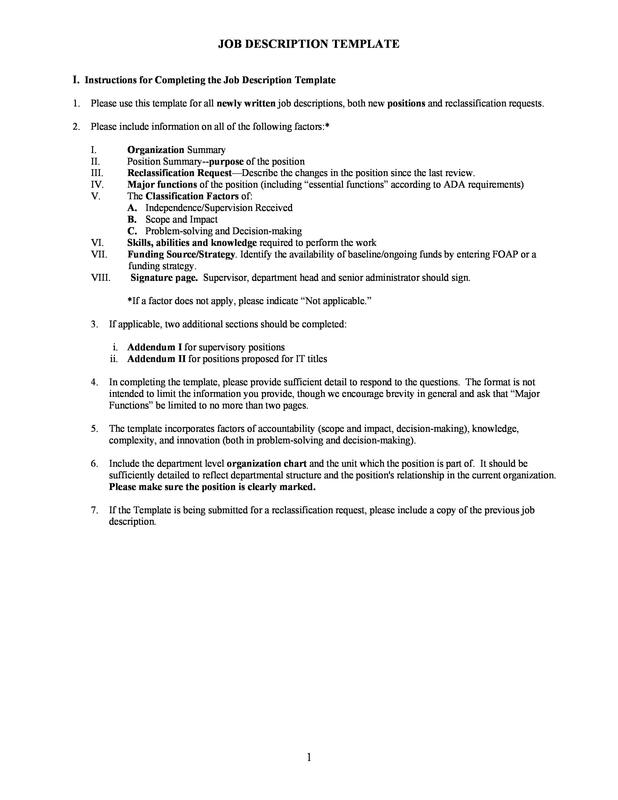 For reference, you may use a job description template. 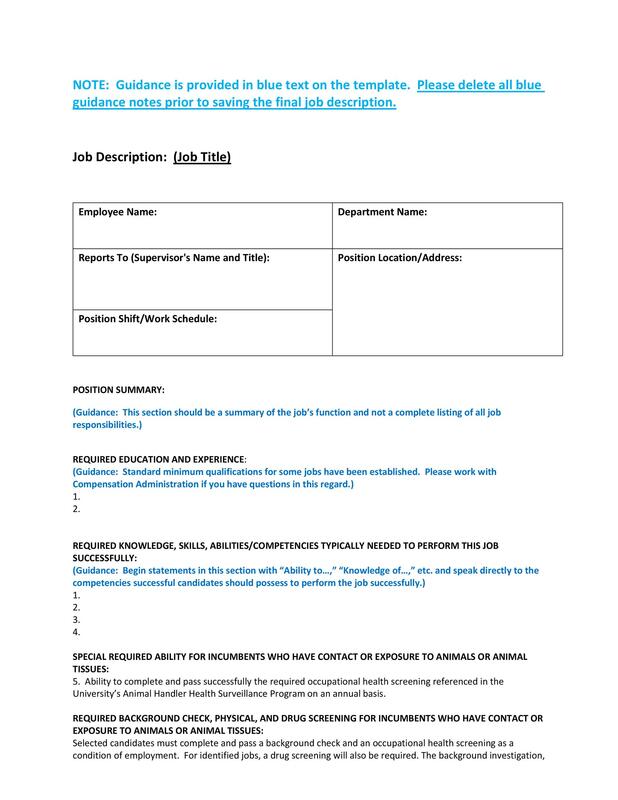 A flexible job description is easier to maintain and doesn’t require modification every time there’s change in duties. 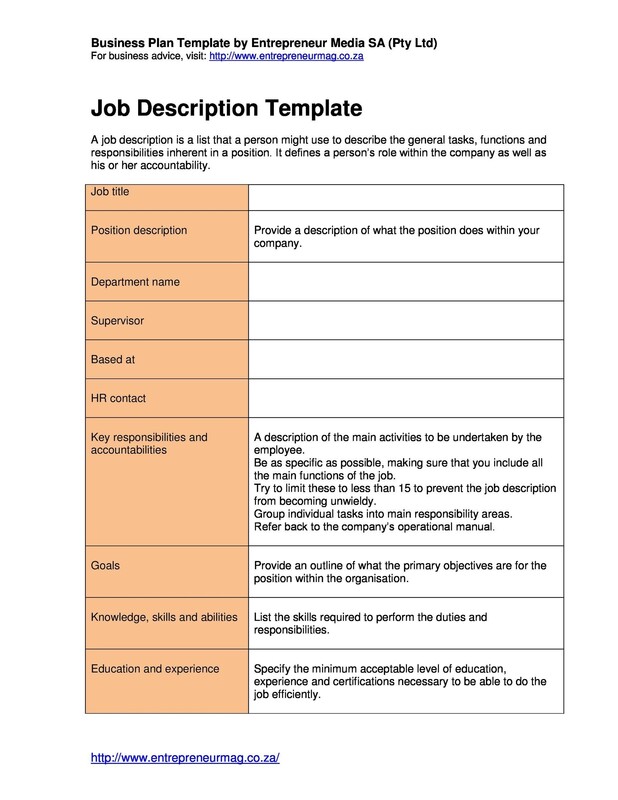 Let’s now take a look at how you can write a good job description. 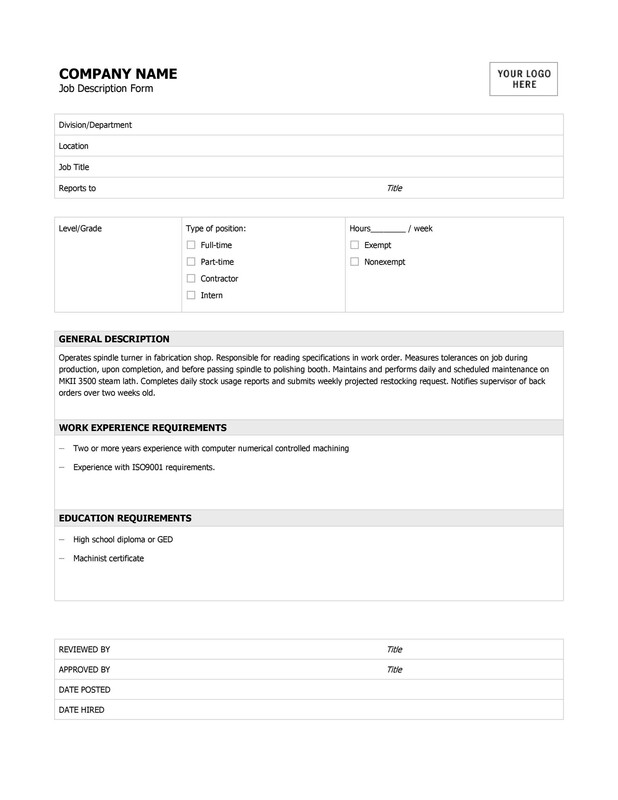 An important first step in recruiting the best candidate for the job is writing a clear and accurate job description. 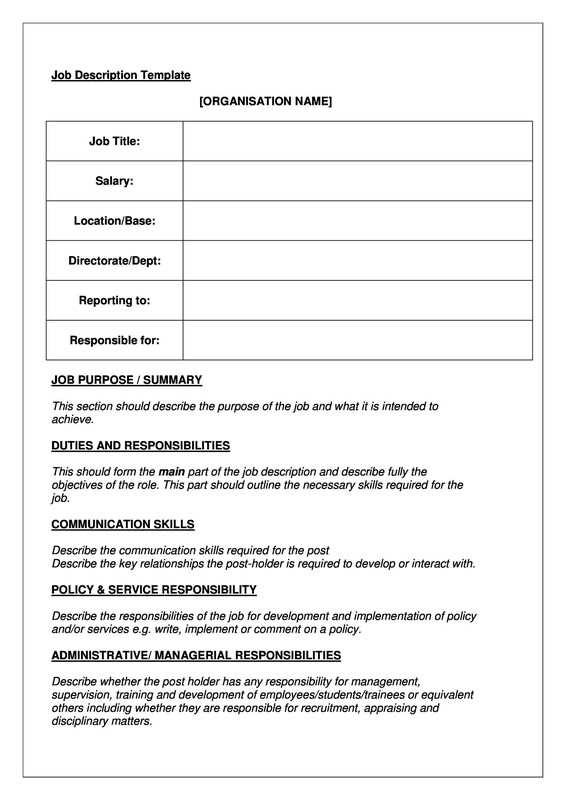 A clear understanding of the job’s duties and responsibilities is required for writing a job description. 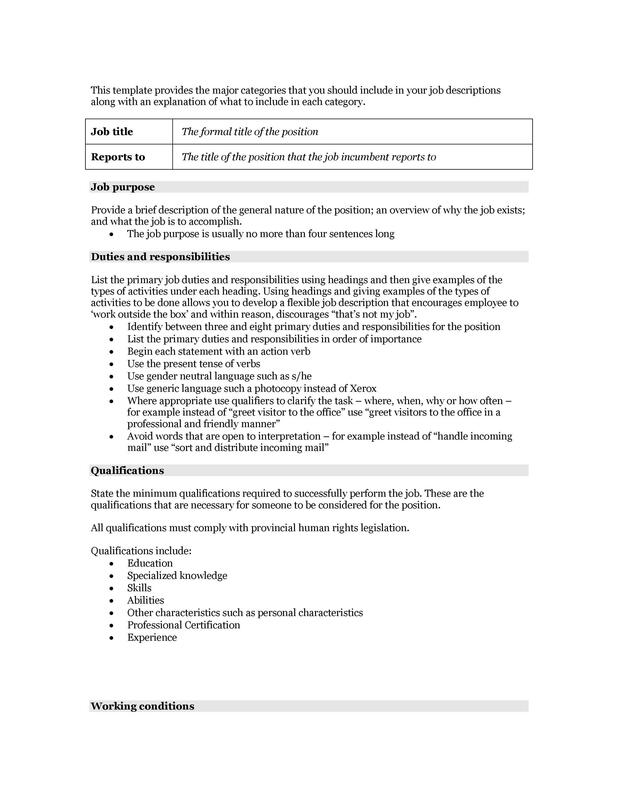 Furthermore, the job description needs to clearly define the skills required for the position. 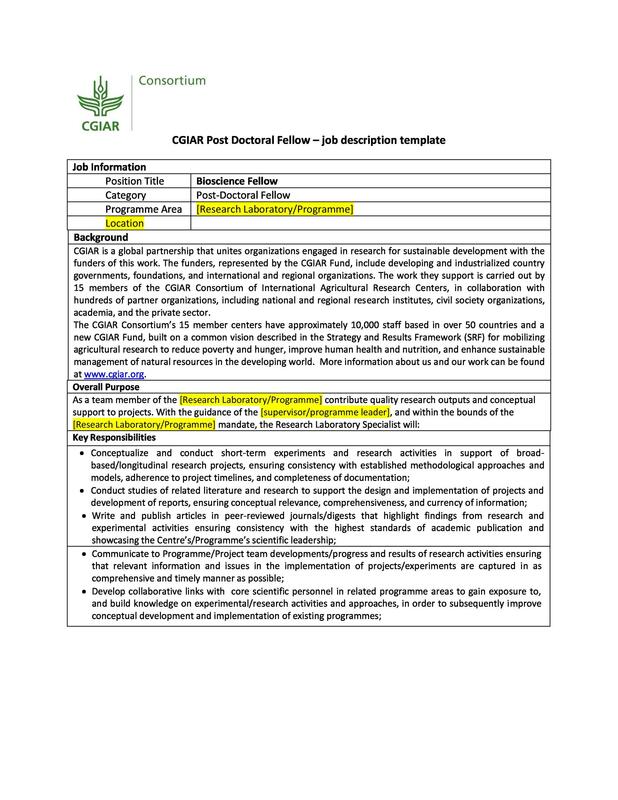 The job description is divided into many different sections. Avoid using equivocal or complicated language instead use clear, concise language. 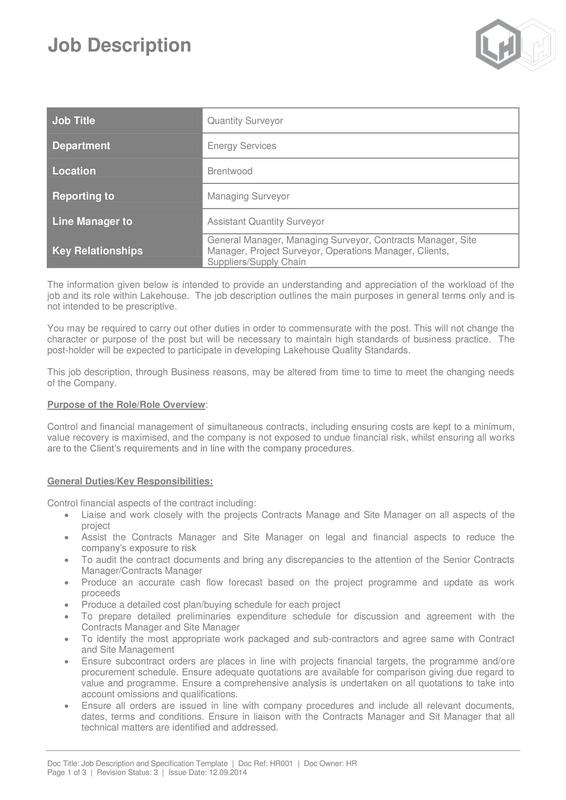 Jon title is the fundamental element of the job description. 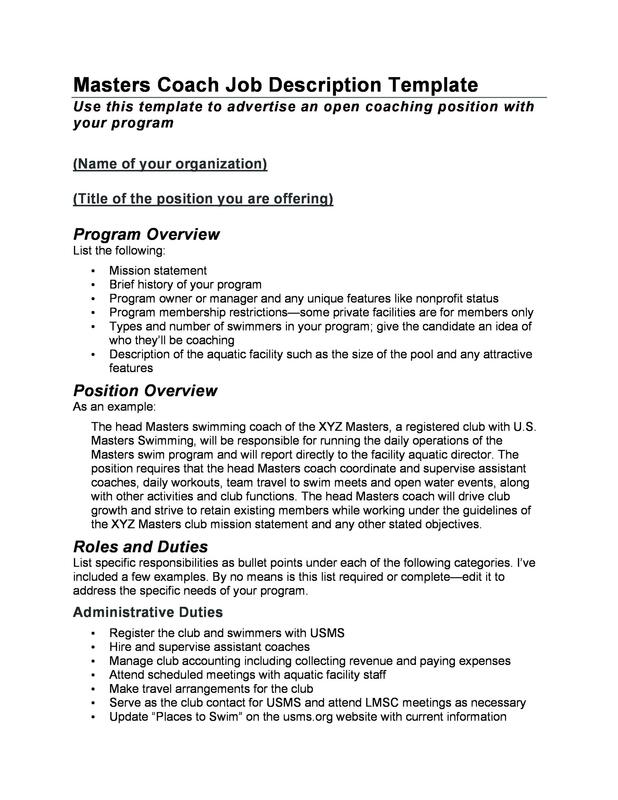 The job title clarifies the position and rank or level. 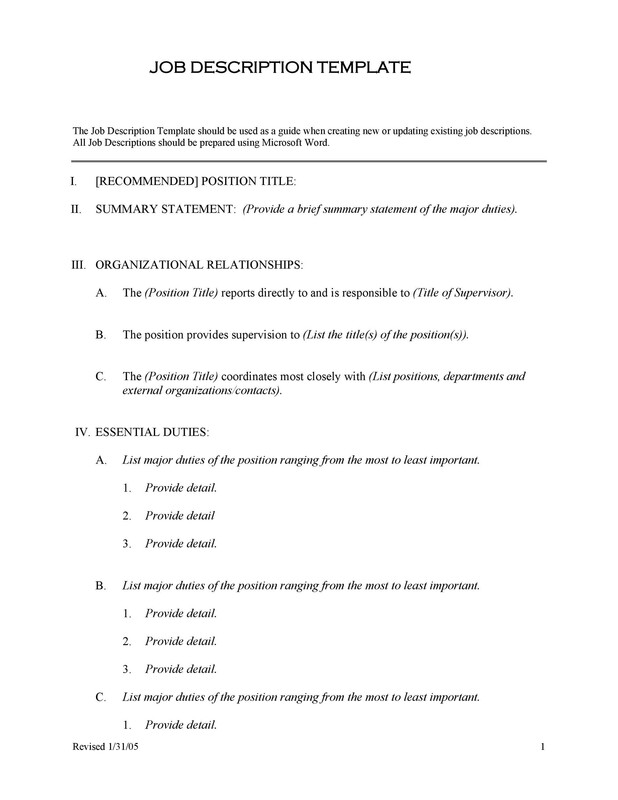 This section should include the position’s duties and responsibilities. Furthermore, it should state the amount of time that needs to be dedicated to each task. Use percentages to represent this i.e. 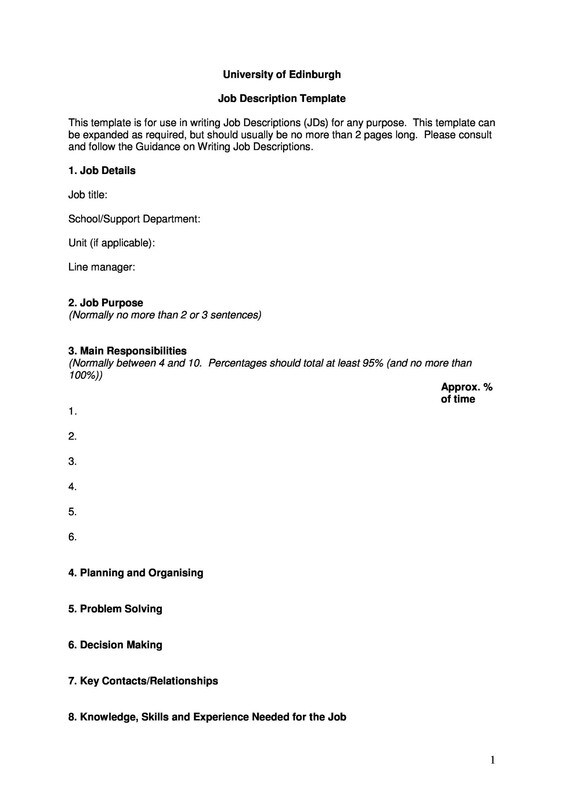 data entry 30%, filling 40% etc. You should describe the duties in two or three sentences. 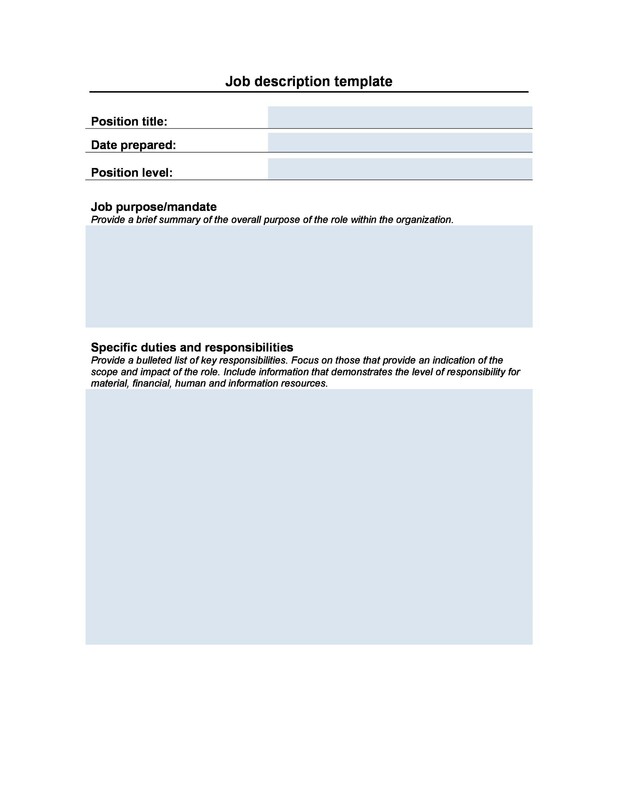 Additionally, the duties should contain an object, an action, and a purpose. Finally, the duties should be result-based. 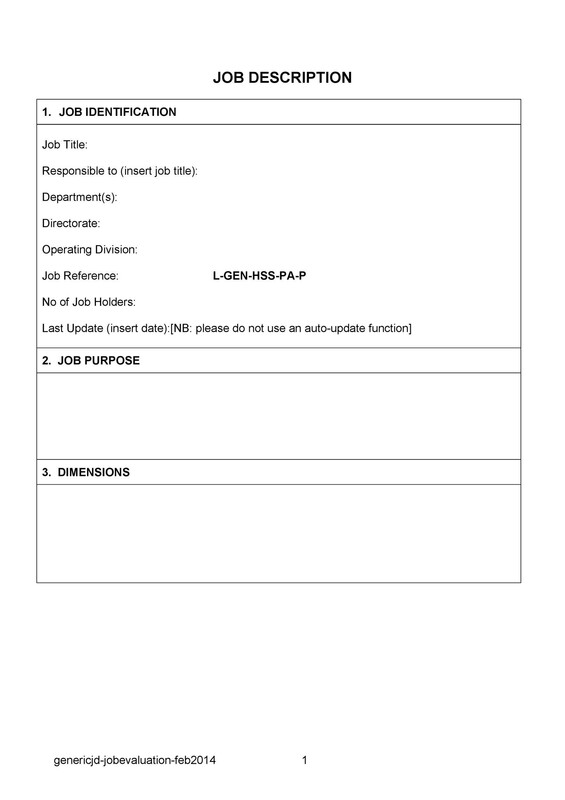 A detailed description of any and all roles the employee will hold is what this section provides. 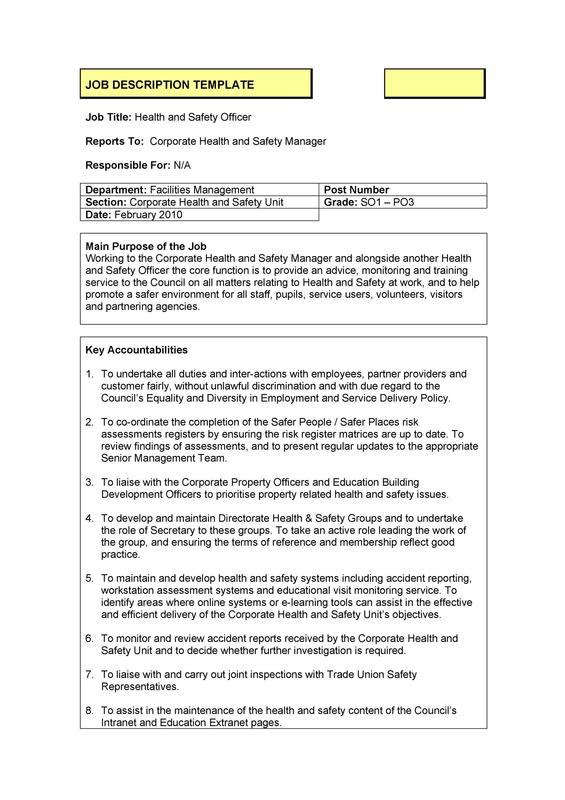 This section should include the supervisory roles (if any) of the employee. Furthermore, it should state who they will report to. 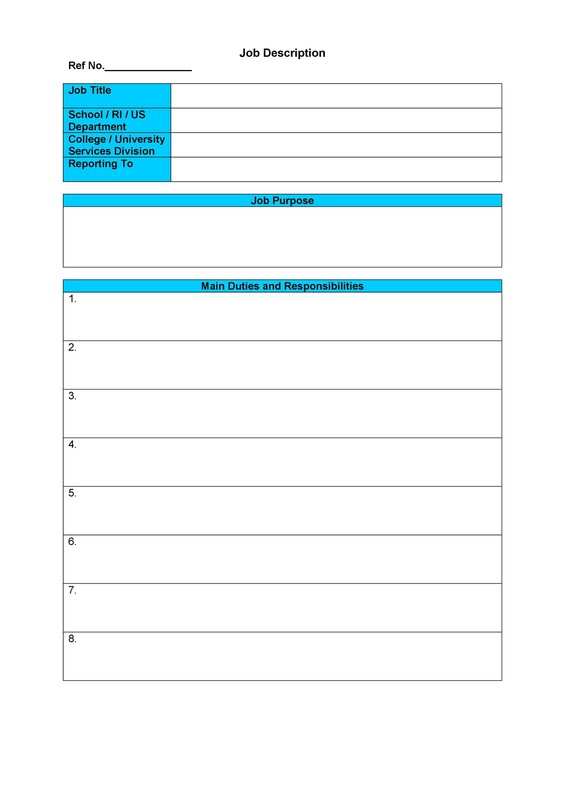 Also, notify employees/ applicants if they’re supposed to work with other employees or departments. When detailing the skills and experience required to perform the job, be as specific as possible. 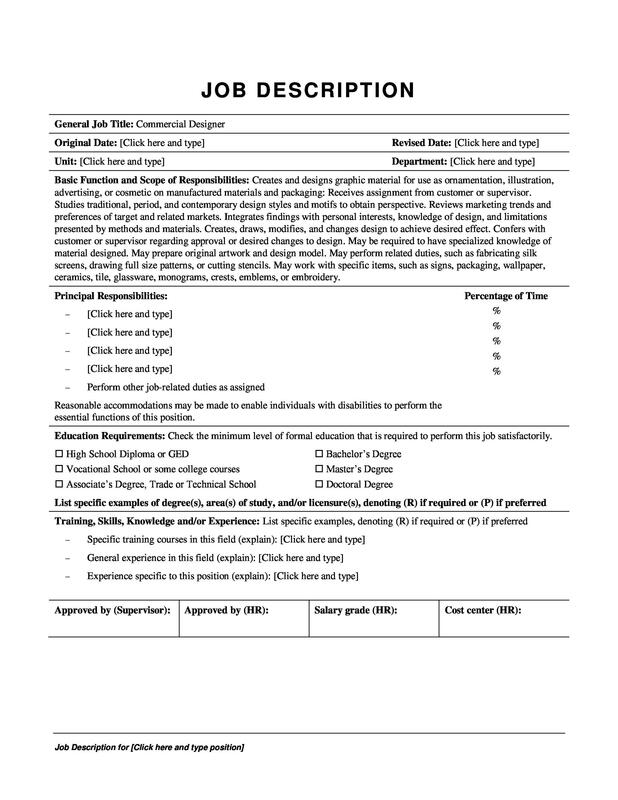 For example, list the type if software or hardware used to perform the job if the position requires the use of a computer. Since they’re two entirely different things, it is important for you to list skills and competencies separately. Skills are activities the candidate can perform by using the qualifications they’ve obtained or things they’ve learned in the past. 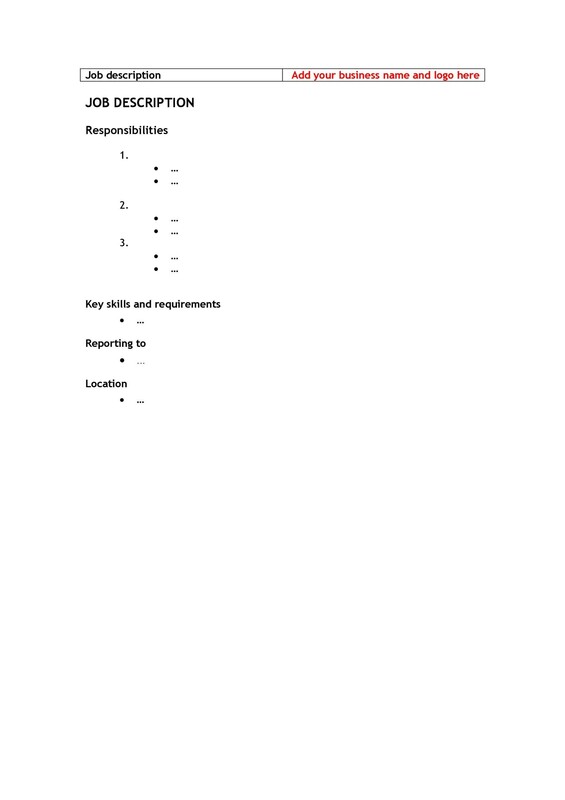 On the other hand, competencies are attributes or traits you expect the candidate exhibit in the role. The ability to give effective presentation learned through practice and study is an example of a skill while an innate characteristic such as strong communication is an example of competency. Today, extra weight is being to behavioral competencies such as communication, flexibility, leadership, initiative, and teamwork as companies move towards competency-based job descriptions. 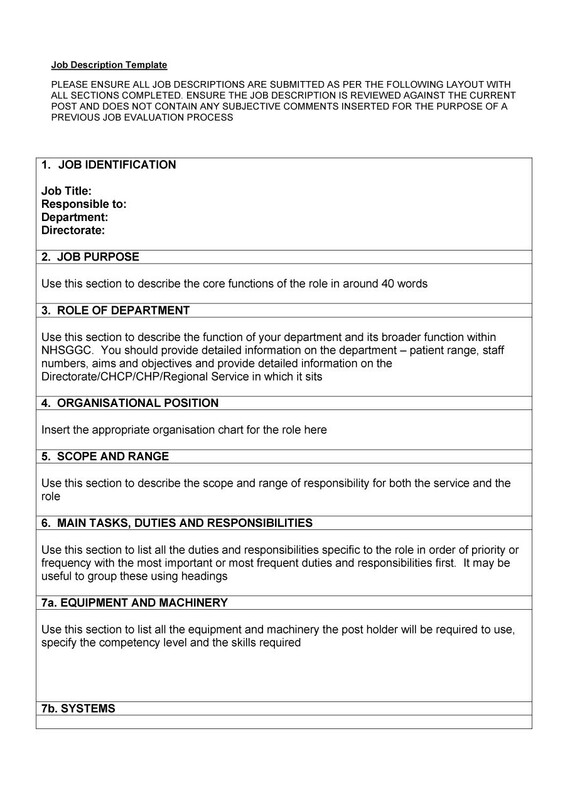 This section should include the strengths required to perform the job. 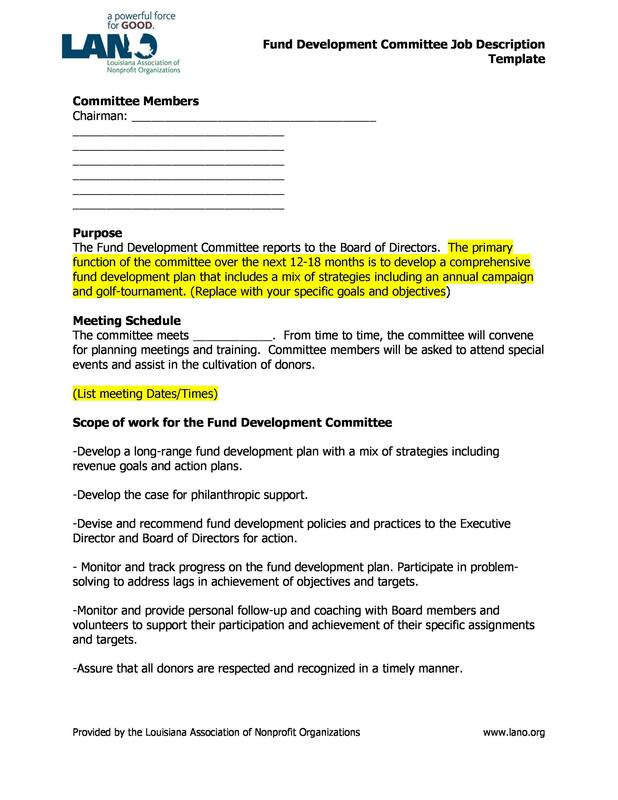 An example of this would be the ability to work with multiple managers and tight deadlines. 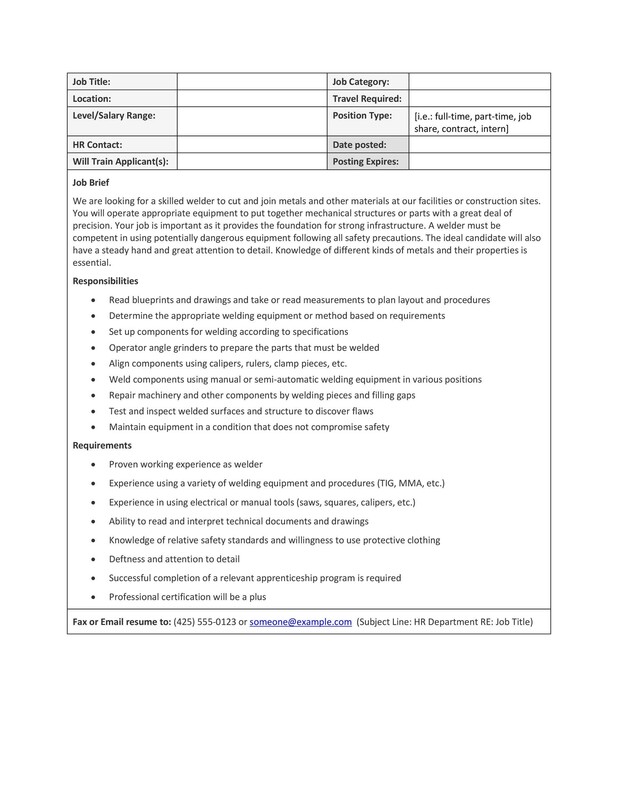 This section should include the job’s physical location, the position’s days and hours, and any potential over time required to perform the job. 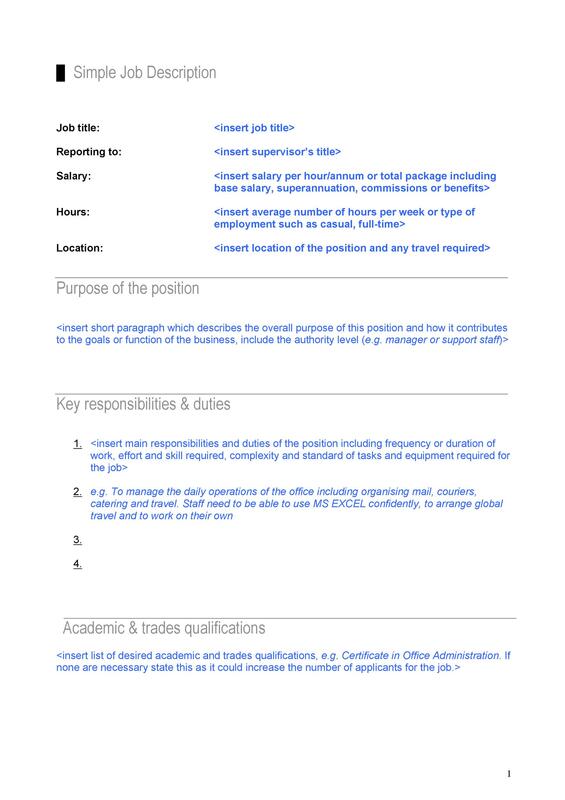 This section should include the starting, mid-range, and maximum salary for the position. Furthermore, you should include the eligibility criteria for additional compensation such as annual raises, performance bonuses, and sales commissions. Rather than assigning a particular salary to the position, assign a salary range that varies based on education and experience. It is important that a job description isn’t an impossible wish list of every skill in the world. 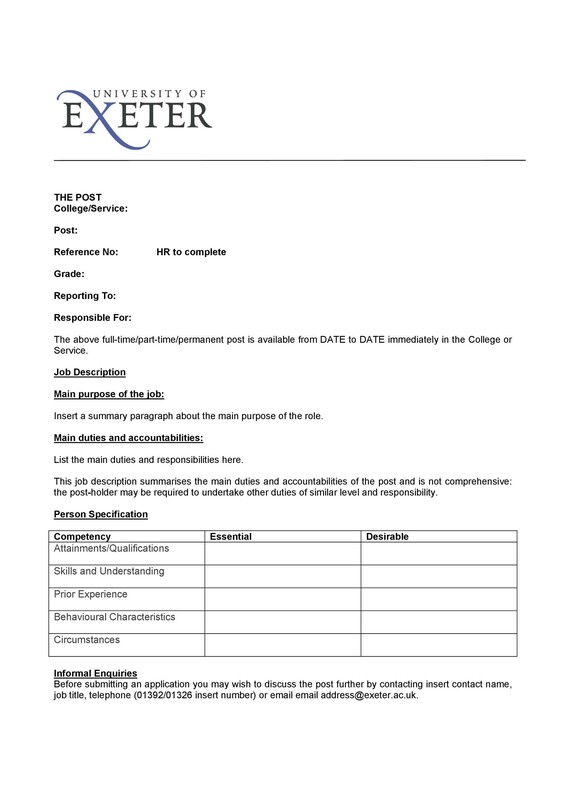 Instead, the job description should represent the exact credentials required to perform the job. Creating a job description without the input of HR, line management and employees in a similar role is a mistake that you must avoid. 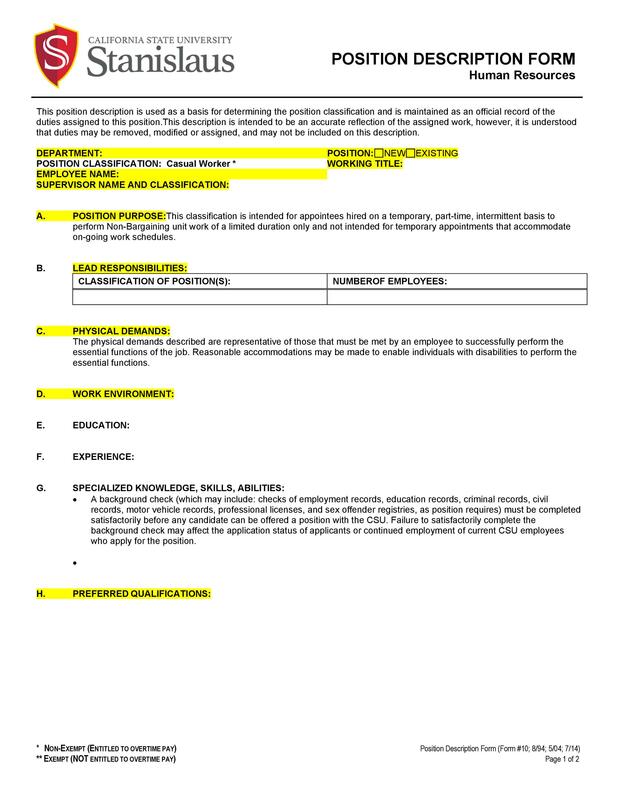 There are certain words and phrases that you must not include in the job description because these words and phrases may be interpreted as discriminatory which in turn may prevent you from attracting the diverse applicants that companies strive for. Job descriptions are extremely useful in attracting the right candidates for the job and encouraging employees to perform at their best. 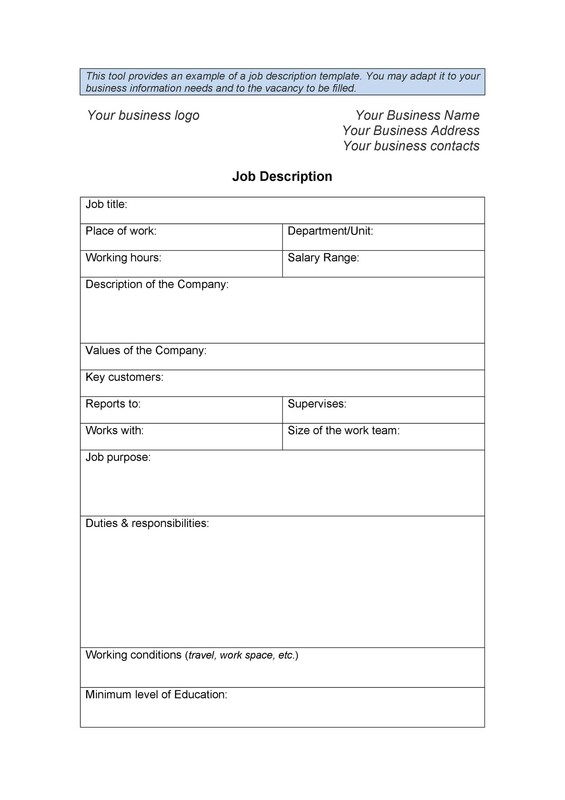 You can easily write a job description by downloading our job description templates. 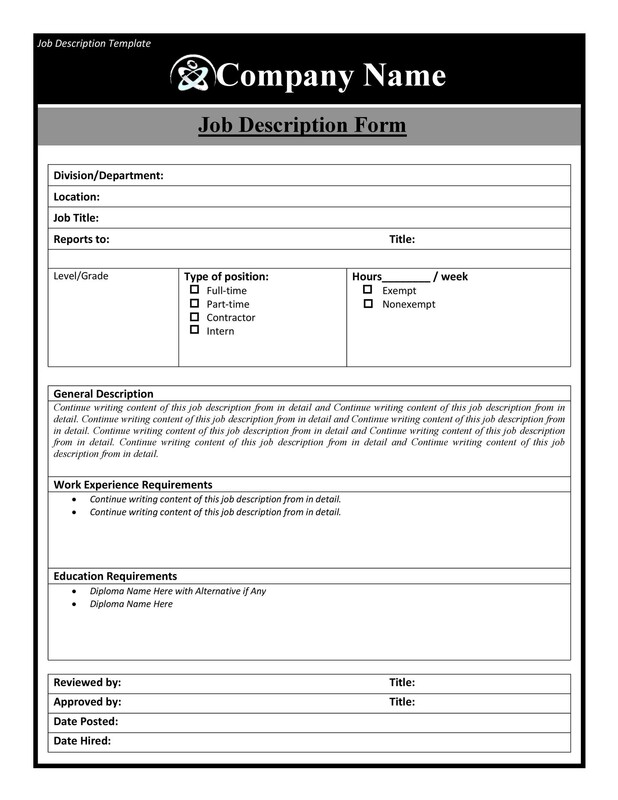 With the help of our job description templates, you will be able to write an effective and winning job description.